The Olympics, the Super Bowl, US Soccer, the Indianapolis 500, even the Little League World Series. The power of CENTURY 21® Marketing can help you reach farther than ever before. As a franchisee your listings will be automatically distributed to over 500 real estate aggregator sites such as Realtor.com, Zillow, Trulia, and Homes.com, and the list goes on and on. From national print campaigns and customizable ads to web banners and real estate website sponsorships, our System can put you at the doorstep of a larger audience than ever before. With 42% of consumers starting their purchase journey online****, the digital marketing team utilizes a number of Search Engine Optimization, Search Engine Marketing and Display Advertising tactics to target prospective home buyers and sellers, drive them to Century21.com and connect them with agents affiliated with the CENTURY 21® System. 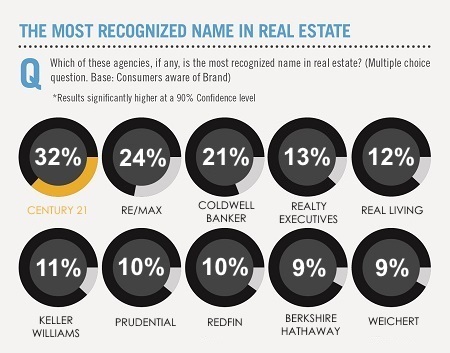 The CENTURY 21 System has the largest Facebook and Twitter following among national real estate franchise companies*****. More importantly, the brand provides engaging social content and a comprehensive C21 Social for Business platform to make social networking easier and more effective for you, our franchisee. We deliver tools to you and your affiliated agents that can help grow your business, including exclusive partnerships with Google AdWords, Videolicious and C21 Social for Business. To keep in touch with clients and turn leads into closed transactions all system members can utilize our fully integrated CRM system with over 500 specially designed templates. Templates including greeting cards, newsletters, postcards, recruiting materials, and drip campaigns in both English and Spanish, all at no charge. We offer a loyalty program that provides personalized and professional-quality magazines and greeting cards to help system members cultivate and maintain relationships with clients. Do you know how many views and leads your listings are getting across the web? Our proprietary program provides this information plus it creates a report that you can set up to automatically send to your sellers every two or four weeks. This data overcomes the number one objective of sellers, which is that they don’t receive regular updates from their agent. This is a great listing and recruiting tool. Your success is valued and you should be rewarded for it. That’s why we offer retreats for our top agents and a Global Conference hosted in places such as Hawaii, the Bahamas, San Diego, and Las Vegas. Complete the contact form and we will have an independently owned and operated local brokerage contact you. Register and successfully complete the real estate pre-licensing course for your state. Schedule and pass your state real estate licensing test. Affiliate with a local real estate broker.